Photos by Amanda Cook (top left), Todd Carnahan (bottom left), and Matthew Morrison (right). Saskatoon is a shrub or a small tree growing 1-7 m tall, with smooth stems and dark-grey to reddish bark. The leaves are deciduous, thin, round to oval in shape, and are distinguished by the regular toothing along the top half of the leaf. The flowers are white, with five elongated oblong petals. The berries are initially dull red at first, and turn purple to nearly black when ripe in the summer. Saskatoon plants often grow together in thickets or clumps. Saskatoon is distributed along the Pacific Coast from California to Alaska, eastward as far as Ontario, and is most prominent in the interior of Canada. It is found along rocky shorelines, bluffs, meadows, thickets, and forest edges in areas of low to middle elevation. Saskatoon grows quickly after disturbances such as fire, logging, and insect outbreak. 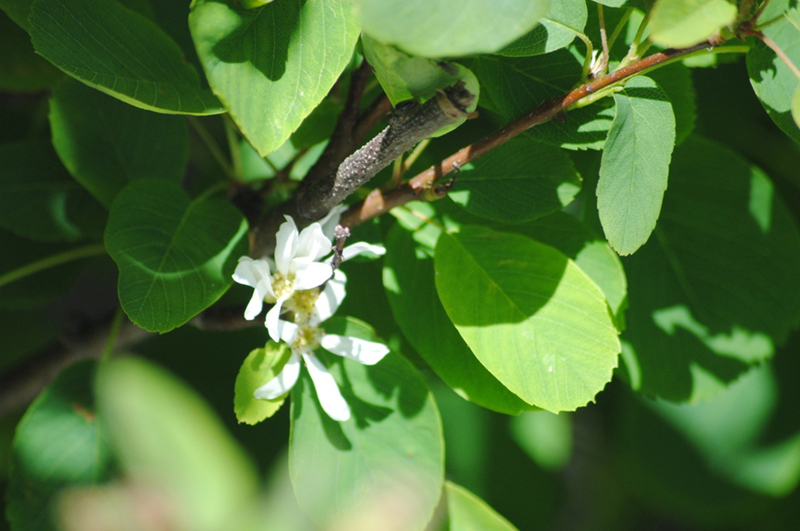 Amelanchier is a genus of approximately 20 species including juneberry, shadebush, sugarplum, and wild pear. Most grow in clumps or thickets and have a similar range, structure, and bark to saskatoon. Saskatoon can be distinguished from these species by its berries, toothed leaves, and flowers. Saskatoon is valued for its plump, flavourful berries which can be eaten raw, baked into pies, cooked into jam, or fermented into wine. Horticulturists have developed several varieties for commercial and garden use. It is also used in restoration practices. Across its range First Nations use Saskatoon extensively, and many cultures practice burning to encourage larger and thicker strands. 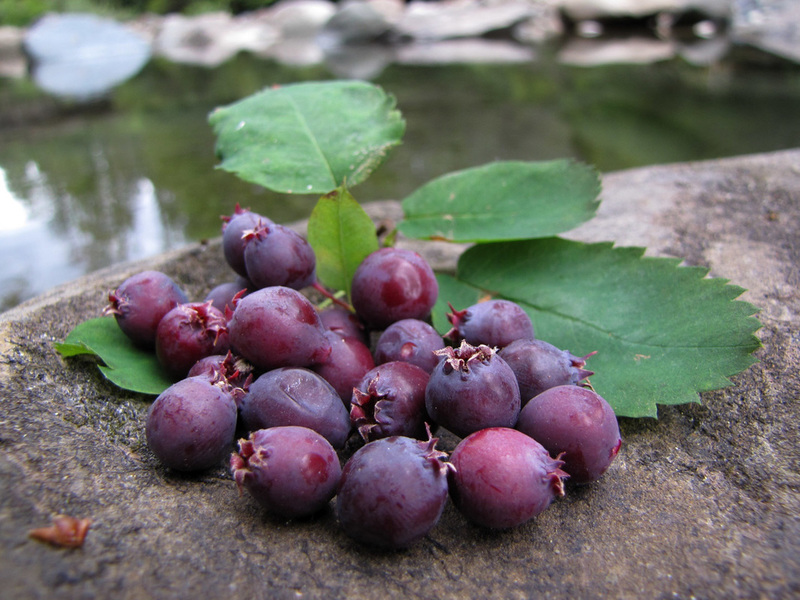 The berries are eaten fresh or dried and are often added to other foods for sweetness and flavour. The bark can be boiled into a tea to treat indigestion, and the leaves and bark provided medicine for recovery after childbirth. In the Interior of BC the strong and straight-grained Saskatoon wood was commonly used to make arrows, digging sticks, tool handles, and drying racks. Nesom, Guy. 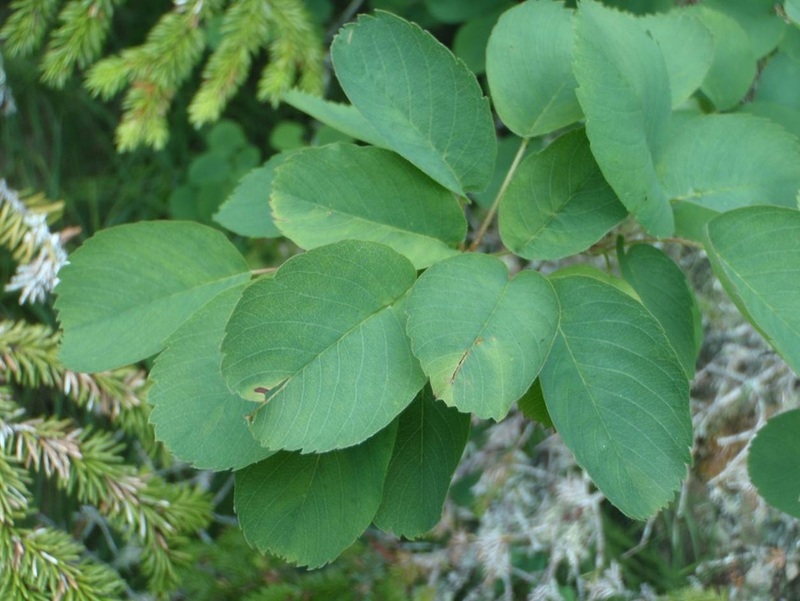 Saskatoon, Amelancheir Alnifolia (Nut.) Plant Guide. United Stated Department of Agriculture Natural Resources Conservation Service. Accessed on 20/11/14. Pojar, J. and MacKinnon, A. (1994). Plants of Coastal British Columbia, including Washington, Oregon, and Alaska. Vancouver, BC: Lone Pine Publishing. P 72.